Every year the ICPC Plenary attracts a global and industry-specific audience to consider the protection of submarine cables—the infrastructure of the Internet. Participation provides an excellent opportunity to engage with submarine cable owners, suppliers, installers, surveyors, academics and service providers regarding the planning, installation, operation, protection and maintenance of submarine cables. The 2019 ICPC Plenary will take place in the Courtyard Liberty Station Hotel in San Diego, California USA from 14-16 May 2019. The ICPC asks interested presenters to submit abstracts for proposed presentations no later than Friday, 8 March 2019. The ICPC welcomes abstracts from ICPC Members and other interested parties. For any enquiries, please send an e-mail to the ICPC Secretariat via: secretary@iscpc.org. After six decades, the International Cable Protection Committee (ICPC) continues to fulfil its mission by advancing submarine cable protection worldwide. Today, marks the 60th anniversary of the ICPC’s first Plenary held on 26 November 1958. In the mid-1950’s, a group of submarine cable systems operators formed The Cable Damage Committee (CDC). At the inception of TAT-1, (the first transatlantic coaxial telephone cable system), an international committee was conceived. The TAT-1 system used the unidirectional flexible repeater where two cables were needed to make a transmission circuit. Because two submarine cables were needed to achieve bi-directional communication, TAT-1 was twice as vulnerable to faults via ships’ anchoring or commercial fishing. At CDC’s inception, eleven Member organisations belonged to the group. Today, the ICPC has grown to over 175 Member organisations with Membership open to governments, ship operators, system suppliers, survey operators and “Associate” Members. The inaugural CDC Plenary meeting was chaired in London on 26 November 1958 with an agenda focused on cable damage by beam trawlers in the North Atlantic and North Sea, charting of cables, and acting as a liaison with the thriving fishing industry—topics that remain on the agenda today. The CDC continued to meet in London until its fifth and last Plenary in 1967 and in that year, the CDC Members decided to change the organisation’s name to the International Cable Protection Committee to better emphasise submarine cable protection rather than submarine cable damage. The first Plenary under the new name was held in Paris, 1968. 1972: ICPC addressed the United Nations Convention on the Law of the Sea (UNCLOS) for the first time and continued to do so until 1982 when the international treaty was ratified by most nations and signed into law. 1973: ICPC introduced its first Recommendation (a guide promoting the highest goals of reliability and safety in the submarine cable environment) titled: ‘The recovery of out of service cables.’ Currently, the ICPC has 17 ICPC Recommendations. 1973: ICPC produced its first film ‘The Catch That Nobody Wants.’ Since then, the ICPC has produced three more educational films. The ICPC has accomplished much throughout the years including: educational industry videos and published monographs, international joint workshops and an inaugural webinar. 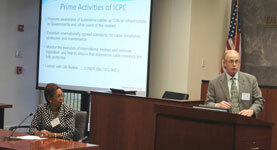 The ICPC continues to support peer-reviewed scientific research, publish submarine cable data, engage with the wider community as well as participate in UN Assembly meetings. By working cooperatively with the International Seabed Authority (ISA), European Subsea Cables Association (ESCA), International Hydrographic Organization (IHO), Rhodes Academy of Oceans Law and Policy and SubOptic, ICPC will always promote “sharing the seabed in harmony with others.” Also this year, the ICPC’s General Manager was interviewed on the flagship BBC World Service ‘Newshour’ programme, and the end of the segment, the interviewer signed off stating: ‘The International Cable Protection Committee – who ever knew there was such a thing!’ – apparently an increasing number of people around the world now appreciate the significance of submarine cables in promoting and protecting both national and global economies and international trade. 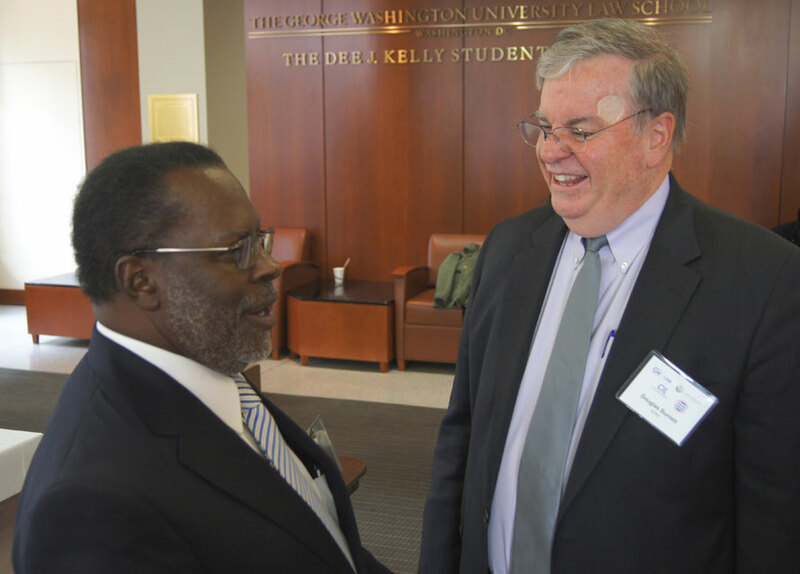 ICPC’s current Marine Environmental Advisor (Prof. Lionel Carter) will relinquish his formal role in June 2019 after a long, distinguished and successful period of service. For that reason, ICPC is seeking to interview suitable candidates for the post of Marine Environmental Advisor to participate in a period of transition and then take up the role from July 2019. ICPC is largely volunteer-led, and with a modest honorarium, the role of MEA remains vital in protecting the ICPC’s excellent reputation for sound scholarship and peer-reviewed research (as well as communicating these issues effectively) concerning the protection of vital submarine cables within the global man-made and natural ecosystem. It offers the post-holder an opportunity to make a true difference in relation to the understanding of environmental and socio-economic matters related to the global submarine telecommunication and power cable network that is part of the environment, and which powers the modern economy. Please carefully read the documents below and kindly direct them towards potential candidates who may be equipped to serve as the ICPC’s next Marine Environmental Advisor. Applications will be considered and screened by a special multi-disciplinary panel in the ICPC. At the discretion of the panel, suitable candidates may be invited to interview. Please pass this message along to suitable academics/candidates who you feel could take on the role as well. For enquiries, send an e-mail to: general.manager@iscpc.org. ICPC Plenary 2019 will take place at the Courtyard Liberty Station Hotel in San Diego, California USA from 14-16 May 2019. If you did not have the opportunity to register for ICPC’s inaugural webinar: “Cables and the Marine Environment - From Ocean to Cloud” hosted by ICPC’s Marine Environmental Advisor, it is now available ‘on-demand’ via the following link: https://www.iscpc.org/webinar/. If you have already registered but was not able to attend, please select ‘Already Registered?’ via the following link https://www.iscpc.org/webinar/ and you will be prompted to enter your e-mail address to view the webinar. 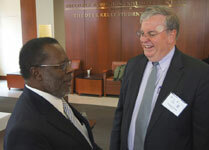 In this webinar, Lionel Carter presents and addresses questions from attendees in a hour-long insightful session. Submarine fibre-optic cables underpin the digital revolution by providing a safe, cost effective means of moving vast amounts of data around the globe at the speed of light. Cables are thus of vital social and economic importance – fact long recognised by the United Nations Convention on the Law of the Sea (UNCLOS). With that thought in mind, and given the heightened interest in environmental protection, this webinar delves into cables and their interaction with the marine environment. The nature of cables, their effect on the seabed, response to natural hazards and resilience in an increasingly busy ocean, are all covered in this well-illustrated and entertaining talk. For any enquiries e-mail: secretariat@iscpc.org. 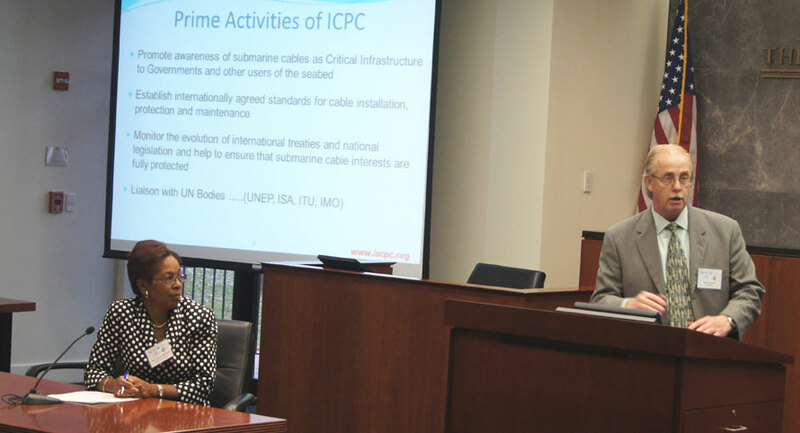 LYMINGTON, United Kingdom—The International Cable Protection Committee (ICPC) is now in consultative status with the United Nations (UN). The grant of the status was recommended by the Non-Governmental Organization (NGO) committee of the United Nations (UN) Economic and Social Council (ECOSOC), and approved by ECOSOC at its coordination and management meeting that took place from 16-18 April 2018. LYMINGTON, United Kingdom—The International Cable Protection Committee (ICPC) celebrated its 60th anniversary Plenary meeting by highlighting the three themes it is addressing to ensure that subsea cables continue to provide reliable long-term socioeconomic benefits to global communities. LYMINGTON, United Kingdom—On 1 March 2018, Mr. Kent Bressie becomes the new International Cable Law Adviser (ICLA) for the prominent organisation, International Cable Protection Committee (ICPC). Kent replaces Doug Burnett who left the role in late 2017 to accept a U.S. Government appointment. The opportunity to submit an abstract for the 2018 ICPC Diamond Jubilee Plenary has been extended to 5 February 2018. LYMINGTON, United Kingdom— In October 1974, the International Cable Protection Committee (ICPC) held its 13th Plenary in Cape Town, South Africa. In 2018, the Plenary will return to the coastal city for its upcoming session as well as celebrate 60 years of heritage since its incorporation in 1958. The ICPC announces its Call for Papers for the 2018 Diamond Jubilee Plenary to be held in the Westin Hotel, Cape Town, South Africa, from 10 – 12 April 2018. The event's theme is “Where Oceans Meet Cables - A global voice for the submarine cable community” and the deadline for abstracts is 5 January 2018. The ICPC is aware of multiple cable failures in the region of Hong Kong that are affecting the speed of Internet communications on some routes. The ICPC does not have any operational responsibility for the international submarine cable network, therefore its officers do not have any knowledge of the cause of this problem or what is being done to rectify it. The primary purpose of the ICPC is to help its members to improve the security of their cables by providing a private forum in which relevant technical, legal and environmental information can be exchanged. In the aftermath of multiple cable failures, the ICPC will routinely consult its members after repair operations have been completed to see what lessons can be learned. Sometimes this exercise results in a Press Release from the ICPC, as happened following the Hengchun Earthquake on 26 December 2006. The Press Release on the Hengchun Earthquake can be found here [?]. Background information on submarine cables can be found here. The About Submarine Telecommunications Cables [?] presentation is particularly recommended. Frequently Asked Questions can be found here. LYMINGTON, United Kingdom—There is much anticipation and anxiety in the air at the United Nations in New York City, USA this July. Many observers understand that a potentially very significant change in the international law regarding oceans looms ahead. The forthcoming PrepCom 4 meeting, held at the UN headquarters, will review many complex issues associated with activities on the high seas beyond national jurisdiction. Issues include both scientific and legal aspects arising under the United Nations Law of the Sea Convention (UNCLOS)—one of the world’s most successful pieces of international legislation. LYMINGTON, United Kingdom—The International Cable Protection Committee (ICPC) has issued its much-awaited Recommendation No. 17 titled: Submarine Cable Operations in Deep Seabed Mining Concessions Designated by the International Seabed Authority. The Recommendation is now publicly available upon request via: secretary@iscpc.org. LYMINGTON, United Kingdom—All good times eventually come to an end, and the 50th International Cable Protection Committee (ICPC) Plenary session that was held in Montevideo, Uruguay, from 25-27 April 2017 was no exception. ICPC Members from around the globe contributed to a successful annual Plenary with the theme of unmissable insights and challenges related to submarine cable planning, installation, protection, and maintenance. Ryan Wopschall (until 2016, a member of the Executive Committee of the ICPC) discusses the technology and infrastructure that is integral to present day connectivity and communication: without submarine fiber optic cables, the world would be a very different, and disconnected place. He examines the key actors and innovations that have brought the technology to where it is today, and the international regimes that have been tasked with its protection. Source: Fletcher Forum of World Affairs Volume 41:1; Winter 2017. ICPC's 50th Plenary was held in Montevideo, Uruguay from 25-27 April 2017 in the Radisson Montevideo Hotel. The event's theme was "Unmissable insights and challenges in submarine cable planning, installation, protection and maintenance." LYMINGTON, United Kingdom—A recently published study of the 290 km-long Basslink power cable shows that its impact on the seabed and associated organisms is "transient and minor". Basslink plays a key role in the distribution of power between the Australian states of Victoria and Tasmania. To protect this infrastructure, the cable was placed in a trench cut into the seabed. However, near Tasmania the cable was placed in an iron pipe conduit in order to safely pass over a 500 m-wide zone of rocky reef and rubble. LYMINGTON, United Kingdom— Submarine Cables and marine Biological Diversity of areas Beyond National Jurisdiction (BBNJ) was the topic of discussion on Monday, 29 August 2016 during a well-attended side event held at the United Nations headquarters in New York City, New York. The International Cable Protection Committee (ICPC) presented on the organisation’s role within the ocean community and highlighted its newly published and informative white paper on the subject of submarine cables and BBNJ. ICPC publishes white paper: "Submarine Cables and BBNJ"
Preparatory Committee established by General Assembly resolution 69/292: Development of an internationally binding instrument under the United Nations Convention of the Law of the Sea on the conservation and sustainable use of marine biological diversity of areas beyond national jurisdiction. The ICPC announces the abstract deadline for the Call for Papers has been extended to 9 January 2017. The theme for the 2017 ICPC Plenary will be: Unmissable insights and challenges in submarine cable planning, installation, protection and maintenance. LYMINGTON, United Kingdom—27 July 2016 marks the 150th anniversary of the laying of the first, fully operational submarine cable to span an ocean. Linking Ireland and Newfoundland, the Atlantic cable was symbolically the start of a global communications revolution that continues today. Modern submarine fibre-optic cables—which are the direct descendants of the 1866 telegraphic cable—now account for over 95% of all trans-oceanic communications and underpin the Internet. This latest development has profoundly changed society and economies. On 7-8 April 2016, in Ankara, Turkey, an important academic milestone was reached when High Voltage Direct Current (HVDC) cables in the Area Beyond National Jurisdiction (ABNJ) or high seas proper were studied by a blue ribbon team of international legal scholars, diplomats, environmental scientists, and industry experts. This study was a part of the DEHUKAM International Workshop 2016 “Legal Status of Submarine Cables, Pipelines and ABNJ”, the inaugural workshop by the Research Center of the Sea and Maritime Law of Ankara University (DEHUKAM). The workshop was held jointly by the Center for Oceans Law and Policy (COLP) of the University of Virginia, the Center for International Law (CIL), National University of Singapore, the University of Bergen in Norway, and the International Cable Protection Committee (ICPC). State participation included representatives of the Ministries of Foreign Affairs of Turkey and Iceland. Distinguished participants from the International Tribunal of the Law of the Sea included the President Judge Vladimir Viadimirovich Golitsyn (Russian Federation), Vice-President Judge Boulalem Bouguetaia (Algeria), and Judge Markiyan Kulyk (Ukraine). LYMINGTON, United Kingdom—The Case for Cables– Protecting and Enhancing the Global Environment with Power and Communications, was the central theme to the successful and well-attended International Cable Protection Committee (ICPC) Plenary meeting which was held in Hamburg, Germany from 12-14 April. With 63 Member organisations in attendance and representing 29 countries, the 49th annual ICPC Plenary gathered together influential people from the undersea cable industry to convene and exchange ideas. The success of the 2016 ICPC Plenary is largely attributed to all its Members—from every sector of the industry—joining together, being heard, and cementing the ICPC in its status as the industry’s international “voice” for the protection of undersea telecommunication and power cables. LYMINGTON, UK—Fibre optic submarine cable security is one key priority among cable owners, operators, and chartered vessels. The International Cable Protection Committee (ICPC) represents member companies that own or operate about 98% of the world’s submarine cable systems as well as the cable ship companies laying and maintaining cables. LYMINGTON, UK—On 26 November 2015 in Accra, Ghana, a pioneering Submarine Cable Awareness Workshop was held to bring together cross-sectoral national and international organisations with an interest in the seabed in Ghana’s national waters and Exclusive Economic Zone, with particular reference to pipelines and submarine cables. These cables are of vital social and economic importance internationally, as they underpin the Internet and over 98% of trans-oceanic communications and data transfer. LYMINGTON, UK—On 18 November 2015 in Yogyakarta, Indonesia, a pioneering joint workshop was held by the Coordinating Ministry for Maritime Affairs of the Republic of Indonesia and the International Cable Protection Committee (ICPC) regarding submarine telecommunication cables in Indonesia. These cables are of vital social and economic importance as they underpin the Internet and over 98% of trans-oceanic communications and data transfer. Submarine cables are also a key component of Indonesia’s critical infrastructure as submarine cables provide the ideal means to connect the nation’s thousands of inhabited islands. LYMINGTON, UK—Every year the Hutton Medal—an Earth, plant and animal sciences award—is granted by The Royal Society of New Zealand for outstanding work by a researcher and the International Cable Protection Committee (ICPC) is pleased to announce Prof. Lionel Carter has received this prestigious honour. The theme for the 2016 ICPC Plenary will be: The Case for Submarine Cables: Protecting and enhancing the global environment with power and communications. LYMINGTON, United Kingdom—Last August 2014, a rediscovered YouTube video of a shark biting a subsea cable caused a media storm. According to some commentators, the video signified that worldwide telecommunications were under attack by sharks because submarine fibre-optic cables are the backbone of the global Internet. The International Cable Protection Committee (ICPC) has reviewed records of cable faults worldwide, and together with an assessment of the video, conclude that much of the media hype was incorrect. Essentially, sharks and other fish were responsible for less than 1% of all cable faults up to 2006. Since then, no such cable faults have been recorded. LYMINGTON, United Kingdom—Enhancing Submarine Cable Security and Co-operation in Balance with the Environment, was the central theme to the successful and well-attended International Cable Protection Committee (ICPC) Plenary meeting which was held recently in Telegraph Bay, Hong Kong SAR. LYMINGTON, United Kingdom—In their inaugural workshop, the International Cable Protection Committee (ICPC) and the International Seabed Authority (ISA) held a joint seminar: “Submarine Cables and Deep Seabed Mining—Advancing Common Interest and Addressing UNCLOS ‘Due Regard’ Obligations” from 10-11 March 2015 in the New York offices of Douglas Burnett, ICPC’s International Cable Legal Advisor. LYMINGTON, United Kingdom—The International Cable Protection Committee (ICPC) will be holding its 2015 Plenary over 28-30, April 2015 at Le Méridien Cyberport in Telegraph Bay, Hong Kong. With the central theme, Enhancing Submarine Cable Security and Co-operation in Balance with the Environment, the Plenary will provide a valuable meeting point for all sectors of the submarine cable industry to gather and exchange ideas in a region steeped in submarine cable history and rooted in 21st century technological development. LYMINGTON, United Kingdom—The two premier global organisations representing the submarine cable communication industry—the International Cable Protection Committee (ICPC) and SubOptic—have formally signed a memorandum of understanding (MoU) to formalise their relationship and will be seeking to further co-ordinate their activities to the benefit of the submarine cable networks community as a whole. The final workshop report, "Submarine Cables in the Sargasso Sea: Legal and Environmental Issues in Areas Beyond National Jurisdiction," has been released by the co-sponsors: Sargasso Sea Commission, Centre for International Law of the National University of Singapore (CIL), George Washington University Law School, and the International Cable Protection Committee (ICPC). This report is the first ever multidisciplinary effort by scientists, the submarine cable industry, and government experts from Bermuda, the United Kingdom and the United States to study and report on environmental impacts of modern submarine fibre-optic telecommunications cables in Areas Beyond National Jurisdiction (ABNJ) and the high seas. 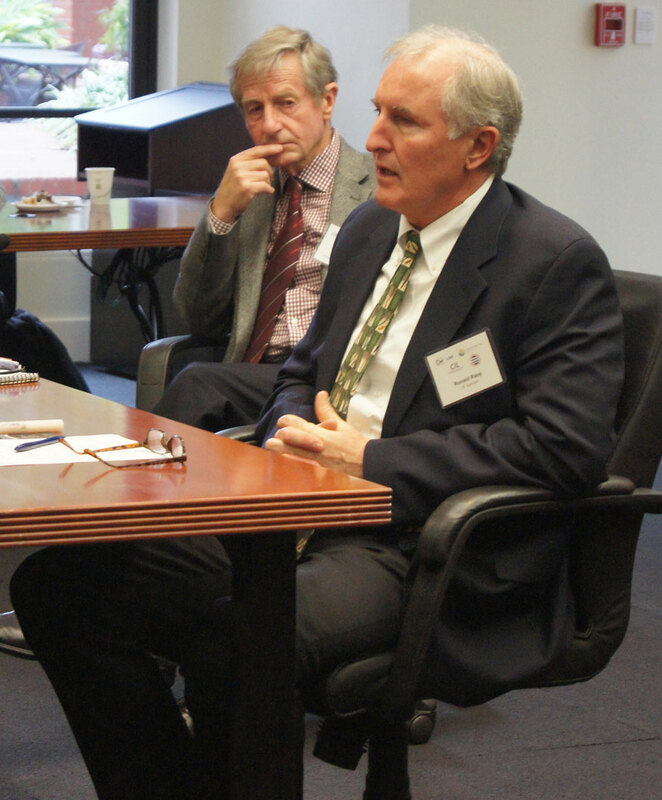 This unique work was compiled from presentations, papers, and discussions at the workshop which was held on 23 October 2014 at George Washington University Law School in Washington, D.C. The 49 page report highlights the value of collaborative work by 40 experts and participants working together in a candid exchange of data and views concerning the United Nations Convention on the Law of the Sea (UNCLOS) and the ABNJ/high seas environment. A copy of the Full Report can be downloaded below. Enderby House and Enderby Wharf was the Greenwich, UK base of the Telegraph Construction and Maintenance Company, who built most of the world’s early submarine cables and is the oldest continuously operating telecommunications factory in the world. In 1864 the factory manufactured the first successful trans-Atlantic telegraph cable. From then until 1975, the factory continued to make submarine telecommunications cable. The Enderby Group seeks to preserve Enderby House and the riverside cable handling gear as a museum dedicated to our industry. This article about the Enderby House project appears in the Newcomen Society Newsletter called "Links". For the 2014 event, 2nd Cable Protection and Awareness Workshop held in both Nigeria and Ghana, ICPC Member and operator Main One Cable Company led a week-long event in October informing local communities regarding the importance of undersea cables, specifically: identifying a cable’s location to avoid damage and ensure long-term protection. The theme for the 2015 Plenary will be: "Enhancing Submarine Cable Security and Co-operation in Balance with the Environment." LYMINGTON, United Kingdom - On 23rd October 2014, the International Cable Protection Committee (ICPC), together with the Centre for International Law of the National University of Singapore, George Washington University Law School and the Sargasso Sea Commission, co-sponsored a workshop titled Submarine Cables in the Sargasso Sea – Legal and Environmental Issues Beyond National Jurisdiction at George Washington University Law School in Washington, D.C. The next Plenary will be held in Hong Kong, 28-30 April 2015 in Le Meridien Cyberport in Telegraph Bay. A YouTube video (August 2014) of a shark biting a submarine cable attracted considerable media attention. The type of the featured cable, its depth and location are unknown. But on the basis of available data, the International Cable Protection Committee notes that cable damage from such attacks is historically rare. As of July 1, 2014, Mr. Keith Schofield has been appointed General Manager of the International Cable Protection Committee (ICPC). Against a backdrop of rapidly changing natural and socio-economic environments, the International Cable Protection Committee held its 47th Plenary to discuss actual and potential impacts of such changes on submarine communication and power cable systems. 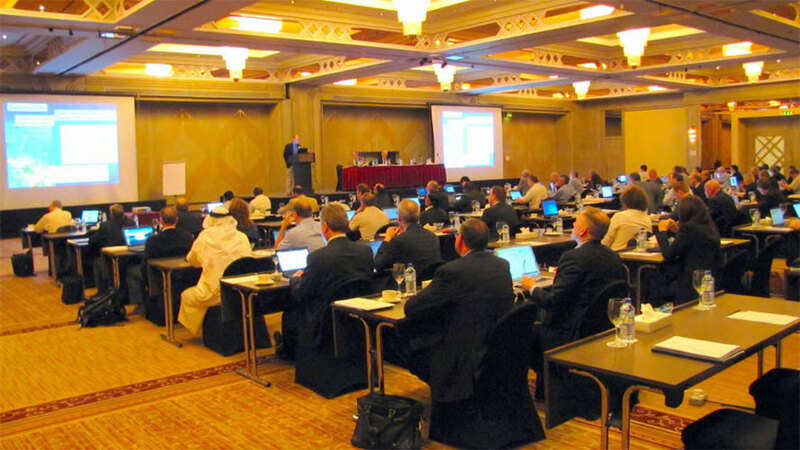 Hosted in Dubai by E-marine, a major submarine cable solutions provider in the Middle East, the Plenary provided a forum for 120 delegates from 32 nations. 64 ICPC Members were represented by 99 of these delegates and their feedback indicates that this Plenary was a huge success. The theme of the meeting - Managing Critical Infrastructure in a Changing Natural & Socio-Economic Environment - attracted experts from the cable industry, governments, legal profession and research organisations. Australia's Amendments to its Pioneering Cable Protection Legislation Recognise the Value of Government Partnership with the ICPC for Protecting Critical Submarine Cable Infrastructure. Australia's Communications Minister Malcolm Turnbull's speech before the Australian Parliament on 14 November 2013 acknowledges the smooth partnership enjoyed by the Australian government and the ICPC in promoting sound, practical and effective government policies that are designed to enhance the protection of submarine cables. In October 2010, the ICPC announced that it has changed its rules to allow National Governments and companies that are key players in the submarine cable industry to be represented within its membership. The ICPC's objective in making this change is to foster improved cooperation between Government and Industry, which is deemed essential to enhance the security of submarine cables.